This year Malaysia will be celebrating 59 years of independence from the British on August 31st 2016. So, throughout this month, I'll share some of my favorite food, that is uniquely Malaysian, and I hope you will like them too. I'll start with the most popular breakfast dish in Malaysia, called Nasi Lemak. The basic meals consist of coconut milk rice, Sambal, hard-boiled or fried or egg, cucumber, slices, fried anchovies and peanuts. Other great accompaniments are deep-fried chicken, Sambal Sotong Kering, etc. This is my “Best Sambal” recipe for Nasi Lemak. There is a bit of prep involved, but the result is worth the effort. 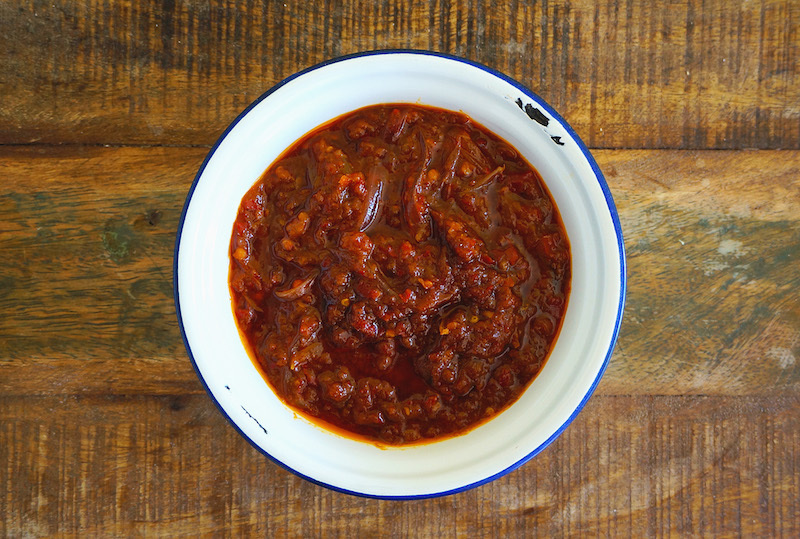 The sambal is delicious, slightly spicy and aromatic. It compliments very well with the traditional-styled steamed coconut rice, which I am going to share with you on my next post. Blend ingredients number 1 to 3 separately. Heat about 2 Tbsp of oil in a wok over moderate heat. Fry the blended shallots and Galangal(1), until fragrant, about 6 to 8 minutes. Add blended fresh chilies and dried shrimps (2), cook until fragrant, about 8 to 10 minutes. Then add blended dried chilies (3) stir and cook until aromatic, and the oil starts to separate, about 10 to 12 minutes. Mix in the roasted Belacan, sugar, tamarind paste, red onion, and Pandan leaf. Keep stirring and let it simmer for about 15 minutes. Then season with salt, and additional sugar if necessary, and cook for another 6 to 8 minutes. Serve warm or at room temperature.